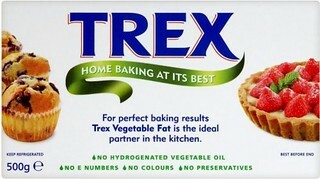 Trex is a vegitable fat, sold in the UK, that can be used for baking. I have used it for sponges and a substitute in buttercream. I needed an alternative to butter or margerine in a sponge in order to obtain a vibrant blue colour. Margerine or butter would have left my mixture with a green colour due to the yellow of the butter / margerine. I also needed a white buttercream for filling and piping, again, margerine or butter would have left the yellow base colour. In order to combat the change in recipe, I used the conversion chart on the Trex website (click here). This worked out well! My sponge batter was lighter in consistency and, as you'd expect, colour. The need for flavouring is essential. You can purchase a butter flavouring, but I was going to use a caramel flavour anyway. The amount of flavouring you need is much less than a sponge with butter / margerine, so I advise checking the flavour regularly and only add small amounts of flavouring at a time. A clean, crisp flavour is achieved. For a basic Victoria Sponge recipe using Trex, see here. I amend the recipe for achieve the volume of batter that I need. Try it! It's very tasty. 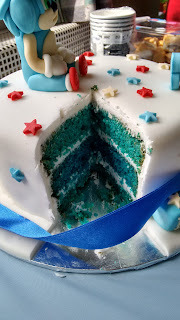 When using colourings, I use a paste rather than a liquid, this left me with a most wonderful blue sponge when baked. You must ensure that the correct amount of Trex to icing is used, otherwise your buttercream will be a greasy mess (see link above for conversion). I have a tried and tested recipe here. Using Trex means using less, so I find that adding a little water at the end of my mix gives me the consistency I require for either filling or piping. This combats the greasyness and, quite honestly, you'd never guess it was Trex. You must use a flavouring! I found the blandness quite off-putting for a buttercream mix. Even a delicate hint of flavour makes all the difference. This review is a comparison to butter or margerine and based on my personal experiences. I have concluded that, with the adjustments which the Trex website suggests, using Trex in baking is no greater in difference of the experience to using butter or margerine. With the exception of flavour and colour, which can be easily remedied, Trex is an awesome alternative. I would recommend this product as a dairy free alternative and for lending itself to vibrant colourings and flavourings. This is the first ever single product review I have written. I would welcome your comments (below) but be mindful that I have a "be nice" policy. Your comments, even if negative, would need to be constructive.